This, again, is one of the assignments I completed the last time around, so I’m going to take the opportunity to springboard and do some thinking-out-loud on something I’ve been studying for the last 6 weeks or so. The question on the table is how much I want my blog to be functioning as an “echo chamber”–you know, the kind of place where folks already agreeing with my worldview get their opinions validated, and folks with different worldview are so turned off they just head elsewhere. Everyone stays siloed, and no one learns or grows or changes (including me). Social media, like Twitter and Facebook, has the effect of tamping down diversity of opinion and stifling debate about public affairs. It makes people less likely to voice opinions, particularly when they think their views differ from those of their friends. . . . The researchers also found that those who use social media regularly are more reluctant to express dissenting views in the offline world. But I really started thinking about this after November 24th and December 3rd. I’m fortunate that I didn’t see many heart-wrenchingly appalling responses to these grand jury decisions among my circle of friends. But there definitely was some racist “white noise”* from certain folks among my extended circle of old high school acquaintances, college co-alumni, and distant relatives several-times removed. I got into one fruitless comments-thread dustup before reminding myself about this article by Jenee Desmond-Harris a friend had shared with me back in August when we were dealing with similarly racist and blood-pressure-increasing responses to the shooting. My take, generally, is that Facebook is a terrible place to change minds or worldviews in the midst of developing news events. Everyone’s emotional. Everyone’s defensive. Nobody keeps the debate on track. But here’s what Facebook comments are good for: revealing data about whether you want your “friends” to be your friends any longer. That is, of course, if you believe, as I do, that the way someone responds to other people’s pain and mistreatment—including the systemic mistreatment of entire groups of people—is a perfectly fine way to decide whether he or she is someone you like or want to continue to interact with. . . .
Desmond-Harris also talks about the psychological toll that can be caused by too-deeply immersing oneself in difficult news cycles. Given the likely futility of changing minds and hearts she describes–and that I myself have experienced–and the actual self-harm that the fruitless attempt to sway opinions can cause, it seems as if maybe writing in an echo chamber may not be so bad after all? And yet. If everyone stays siloed, how will this fucked-up society ever evolve? I’m seeing one too many white people bragging about de-friending other white people. I don’t need your condolences. I don’t need rash actions that absolve you of the responsibility of facilitating hard conversations with folks I will never be able to reach. I don’t have my answer to this dilemma yet. I think ultimately my prayer is that folks who are open to learning beyond the limitations of their privilege will find resources to help them expand their horizons. Maybe some of my liberal, feminist writings here will be part of that expansion. But I also think that there are none so blind as those who will not see. So where does that leave me? The hell if I know. 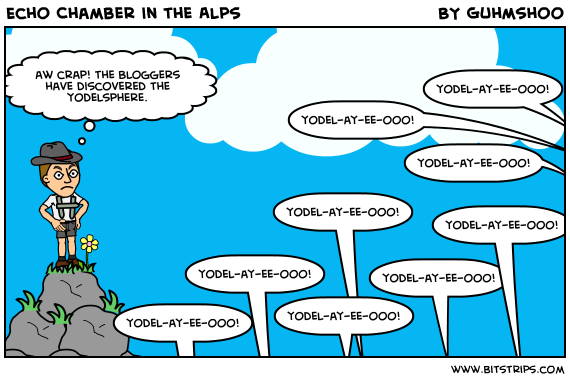 Image credit: Echo Chamber in the Alps by bitstrips user Guhmshoo. Unaltered. To quote you – ‘Not sure I really came up with an answer, but it was worth spending time trying to write my way through the dilemma!’ – is one excellent answer to the last question in your post above! you’ve made some excellent points about not wanting to be an echo chamber. if you figure out the formula, let me know. it’s a very fine line to walk. its true that Facebook is an awful place for political discussion, because people don’t really understand HOW to discuss things without getting all pissy. 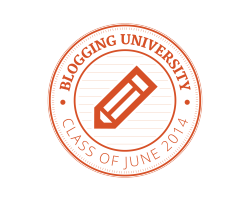 hopefully your blog will be a more conducive atmosphere!